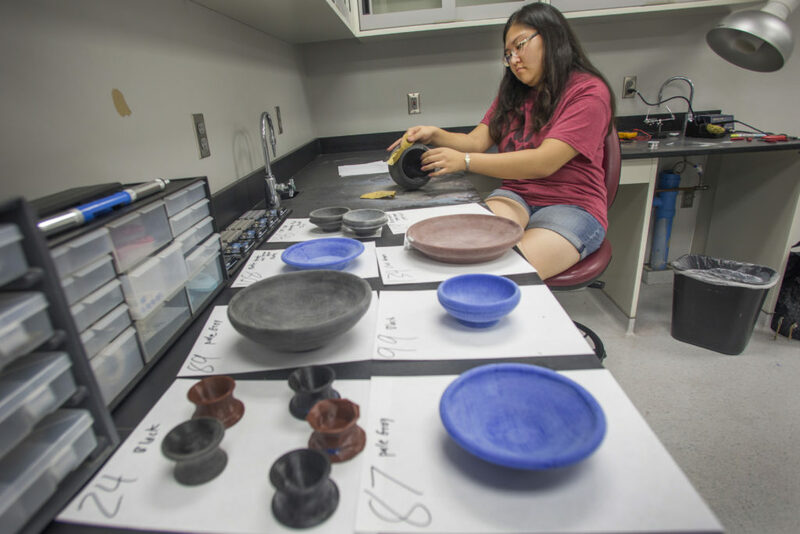 The Facility for Arts Research recently collaborated with the Department of Classics and the Visual Disabilities Program in the College of Education to recreate Cetamura pottery pieces. The artifacts are printed out of polyactide plastic (PLA), which is a biodegradable, corn-based material. At the FAR, there are two small 3-D printers that are used to make smaller objects. The printers can take around an hour to print a small vase or plate. For larger-scale objects, a multimodal additive printer (MMAP) is used. This machine can print objects with dimensions up to 8x6x4 feet, and is being used to create a 5-foot storage jar, or dolium, found at Cetamura out of stacked Styrofoam sheets. After the objects are printed, students from the Department of Classics sand them down and paint them to create authentic looking pieces of pottery. The Florida State University Museum of Fine Arts will host an art exhibit of ancient Etruscan and Roman pottery, which has been recreated with modern 3-D printing technology, making it interactive for the visually impaired because it can be picked up, touched and better understood through accompanying Braille materials. World-renowned archaeologist and art historian Nancy de Grummond, the M. Lynette Thompson Professor of Classics at FSU and director of excavations at Cetamura del Chianti in Italy, will serve as the curator of “Printing Ancient Pottery in 3-D: Etruscan Ceramics from Cetamura del Chianti,” a collaborative effort between the FSU Department of Classics, the Facility for Arts Research (FAR) and the Visual Disabilities Program in the College of Education. The exhibit will open Friday, Oct. 16, with a special session for visitors on International Archaeology Day, Saturday, Oct. 17. Visitors can take a “touch tour” guided by volunteers from the FSU Student Archaeology Club and can handle any of the 28 objects on display. The show will conclude Sunday, Nov. 15. Christina Cha, a doctoral student in Classical Archeology, sands some of the 3-D printed replicas to be displayed at the Museum of Fine Arts. The 3-D pots were created under the supervision of Windham Graves, coordinator of the FAR. “These objects are ones you can hold and touch and that’s something you can’t do in a normal museum,” Graves said. While 3-D printing adds a degree of novelty to the show, the technology was used for a greater purpose. 3D printing of archaeological artifacts to display in an upcoming exhibition at Museum of Fine Arts. Christina Cha, a PhD student in Classical Archeology, sands some of the 3D printed replicas. Sandra Lewis, a professor in the Visual Disabilities Program, and her students are working on the project, fabricating a Braille guide to the objects. Her students will also assist in giving tours of the exhibit for a visually impaired audience. To create the 3-D models, an artist on de Grummond’s team of researchers designed cross sections of the artifacts, which were sent to Graves at FAR. The scans of the designs were input into a 3-D modeling program — in this particular case, Rhinoceros 3D — where the models of a cross section can spin on a spit to get a symmetric 3-D image. Printing pieces of Etruscan pottery out of plastic and foam is highly affordable, according to Graves. The plastic used in this project costs $30 per kilogram, and just around two kilograms of material is being used to print different models, with duplicates — about 40 objects in all. The excavation site at Cetamura del Chianti is an ancient hilltop in the center of Chianti, Tuscany, which was settled by the Etruscans and Romans. Since 1973, students and faculty from Florida State have been conducting research there, where a deep well full of ancient offerings from the Etruscan people to their gods was found. In the 1980s, de Grummond became the director of the Cetamura excavations, and her goal was to make it to the bottom of the well. Over the course of 13 campaigns, FSU teams have dug down over 100 feet within the well. The Etruscans were the first great civilization in Italy, who spoke a different language than the Romans. Written texts are scarce, and that makes the archaeology of the site that much more important. “A lot of what we do is try to figure out their ideas and their evolution by excavating and looking at the material culture,” de Grummond said. “I’ve tried to interpret their religion and their cultures based on their behaviors at the sanctuary and sacred places. The bulk of de Grummond’s current work has been identification of materials from within the well. Her work has revealed behaviors and activities of people from the 7th century BCE to the Middle Ages, encompassing more than 1,000 years of human activity. From the artifacts she and her team have found, they’ve been able to learn about how these ancient people ate, their techniques for creating things, taking care of animals, cooking and everyday life. In her time studying the Cetamura site, de Grummond has discovered thousands of artifacts. Rather than import such ancient objects from Italy, de Grummond had a bright idea: To recreate them with 3-D printing. The upcoming Etruscan pottery exhibit is not the first to create a visually accessible museum experience, but it makes use of the tools of 3-D printing for unique audiences.